When it comes to editing photos and digital images, we’ve never had more software options to choose from. Two apps have been around for decades: Photoshop, and Gimp. We’re throwing Lightroom into the mix as well, and comparing Gimp vs Photoshop vs Lightroom. There are plenty of professionals who use Gimp for their daily work. Let’s face it, switching to the free app is worth it when you can save $180 a year otherwise spent on an (entry level) Adobe CC subscription. But is it realistic to consider Gimp as an option? Can Gimp really do all the things Photoshop or Lightroom does? Is Lightroom better than Photoshop? We’ll be answering those questions and more. In a nutshell, there are five main differences between the apps. Gimp is free while Photoshop and Lightroom come with a premium subscription plan. 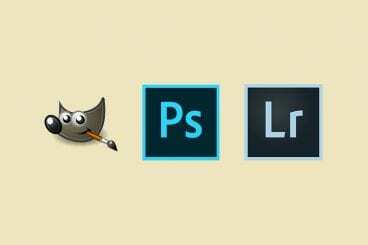 Photoshop is widely supported by the design community. As a result has tons of useful third-party tools, add-ons, templates, and effects to enhance its functionality. You can get both Photoshop and Lightroom for a single price when you subscribe to the Adobe Photography plan. Photoshop and Lightroom don’t support Linux operating systems. Gimp supports PSD files but some can get distorted when importing layers. Dive in for a more detailed breakdown of the apps. Gimp is an open-source raster graphics editor. The app was initially released as a photo editor for Linux users. Since Photoshop wasn’t available on Linux, Gimp was the main photo editor for most Linux-based operating system users. Soon, even the Windows users started to use the app. Then the app came out with a MacOS version as well. Gimp work and feel quite similar to Photoshop. It has almost all the main tools and features of Photoshop with the same functions. Except Gimp was offering all of it for free. One of the best features of Gimp is that the app is very lightweight. The base app itself is only about a 200mb download and it functions on even the decades-old potato computers like a charm. Support for PSD Files: You can import Photoshop PSD files on Gimp for editing advanced graphics, including all the layers. Create Your Own Interface: Rearrange the tool tabs of the user interface to your preference. More than 100 plugins: You can extend the app functionality with community-developed Gimp plugins. Work with animations: You can load and save animations in Gimp using a frame-as-layer format. Consumes low resources: Gimp consumes a very low amount of system resources compared to Photoshop. Low-quality tool functionality: Most of Gimp tools don’t function as effectively as Photoshop. For example, Photoshop’s healing tool is much more powerful than Gimp’s. Slow development: Since it’s open-source, the software and feature development can be slow. Same goes for bug fixes. Limited PSD support: When importing PSD files in Gimp, it’s common for layers to get distorted. Gimp is an open-source software. It’s completely free to download. And you can use the app for as long as you like and on as many computers you want, free of charge. It’s been more than 28 years since Photoshop was first released. The app came a long way since then to become the leader in photo editing and manipulation software. It’s now being used for everything from editing selfies to enterprise-level work. There’s a reason why Photoshop is every designer’s go-to app for professional graphic design work. No app has ever come close to the smooth functionality and the advanced features that Photoshop offers. The massively loyal community is probably the best reason to choose Photoshop. Thanks to this community, there’s no shortage of templates, add-ons, effects, actions, and presets for Photoshop. Every day you’ll discover something new to do with the app. Beginner-friendly user interface: It’s quite easy to manage the tools and tool windows in Photoshop to create a comfortable working environment. Design artworks: In addition to photo manipulation, you can use Photoshop to create artworks and illustrations. Incredible functionality: Each and every tool on Photoshop functions as great as you can possibly imagine. Cutting-edge feature development: Adobe is constantly developing new technologies and features for Photoshop. Cloud storage: When you subscribe to an Adobe plan, you’ll get free cloud photo storage, ranging from 20GB to 1TB. Expensive pricing: Adobe’s subscription pricing plans are not only expensive but can also be confusing. High system resource consumption: Photoshop requires a lot of system resources to function without lag, especially when working with high-resolution images and complex graphics. It costs $52.99 a month to get complete access to all apps in the Adobe Creative Cloud suite, including all desktop and mobile apps. However, Adobe also offers a Photography plan at $9.99 per month. This plan gives you both Photoshop and Lightroom apps with 20GB of cloud storage. Or you can subscribe to the $14.99 per month plan and get only Photoshop with 1TB of cloud storage. Adobe first introduced Lightroom in 2007. The app was mainly designed as a tool for organizing photos and making simple adjustments. It was later improved for performing many other useful tasks. It’s unfair to compare Lightroom with Photoshop and Gimp since it’s not a tool designed for advanced photo editing and manipulation. The tool, however, is adored by photographers as it helps improve their workflow by making it easier to do quick photo adjustments and enhancements with a few clicks. While Lightroom doesn’t provide any advanced tools for photo editing, the app makes photo optimization much simpler and easier. It’s especially useful for designers who work with wedding albums and photoshoots as the app allows you to quickly optimize batches of photos very easily. Easily organize photos: Lightroom makes it easier to organize and manage your photos, especially large batches of photos. Enhance photos in an instant: With easy to use filters and sliders it’s easier to improve photos while also customizing the effects to your preference. Third-party add-ons: Lightroom also supports many useful third-party add-ons and presets that makes your workflow much smoother. Cloud storage: Similar to Photoshop, you get free cloud storage with the Adobe subscription plan up to 1TB. Limited functionality: Lightroom is not capable of most of the functions you can do with Photoshop and Gimp. No tools available for photo editing: Don’t expect advanced healing, clone stamps, and selection tools on Lightroom. Not supported on older Windows: The latest Lightroom CC is not supported on Windows 7 and 8. However, you can use Lightroom Classic CC instead. The best way to get Lightroom is to subscribe to the Adobe Photography plan. It costs $9.99 per month and includes Photoshop as well. If you heavily rely on cloud storage, you can get the Lightroom-only plan for $9.99 per month with 1TB of cloud storage. In the end, it all comes down to how you use the app and what you use it for. For example, if you’re looking to do simple tasks like resize an image, crop, adjust brightness, or do any other types of basic photo editing work, Gimp is more than enough to serve your needs. Lightroom is great for photo optimization, especially for photographers for quickly optimizing batches of photos, add effects to enhance photos, and improve your photo editing workflow. Gimp is capable of handling high-end photo editing work like manipulation, retouching, etc. However, Photoshop does it way better. For professional work, Photoshop should be your default app for achieving perfection and crafting art. Give Gimp a try. After all the app is free to use. If you’re not happy with it, get the Photoshop and Lightroom bundle plan. Adobe also offers a free trial for testing the apps.